1. View of the "Galerie du Temps"
In the December issue of The Art Newspaper, Vincent Pomarède, director of the Département des peintures at the Musée du Louvre, responded to our criticism of the Louvre Lens, notably the "Galerie du Temps" for which he is one of the curators, with a touch of humor explaining that it is impossible to criticize a film without having seen it first, still more so before it is even edited. The film has now come out and we can therefore judge it with our own eyes. Vincent Pomarède was in fact right in saying that we should not criticize the architecture and museology until we had seen it, which we indeed had not. As concerns the first point, the architecture, we would like to speak separately of the exterior and the interior. The exterior is not particularly attractive. Its low façades in brushed aluminum are rather monotonous, neither beautiful nor ugly, of no particular interest. However, there is no question that the interior architecture is a fine achievement, especially that of the "Galerie du Temps", lit from above with a very beautiful light which enhances the works particularly well. The vision from one end to the other of this immense room (ill. 1) with the objects assembled there is truly spectacular. This beautiful installation is nonetheless a bit expensive : 150 million euros at least, more like 200 according to Claire Bommelaer from Le Figaro who redid the figures in a detailed manner and was not contradicted. This is twice the budget originally announced. As concerns the holdings, our belief that the project is intellectually void , has been confirmed in our opinion. The "Galerie du Temps" approaches art history much like one would swich channels or surf the web, that is, "art history in 30’ for dummies". With an ensemble of 205 works we travel from -3300 B.C. to 1850 A.D. and we dare anyone who rarely enters a museum - precisely the target audience here - to understand what is going on. 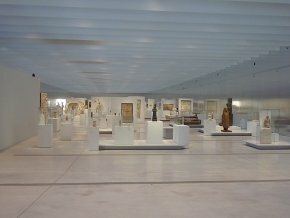 While history programs today tend to neglect chronology, the Louvre-Lens uses it as the basis of its presentation. Both approaches are absurd. Chronological facts are obviously essential but when this is the only key to looking at art with no further explanation or context, it becomes totally incomprehensible. Just because two works were produced during the same period there is no guarantee that there is any connection between them nor easily understandable if there is. In fact, the chronology of the "Galerie du Temps" is brutally manhandled at times. An Egyptian statue from -1700 B.C. is presented at the same level as a Mesopotamian work executed between -1200 and -1100. Clearly, what are 500 years give or take a little ? How can visitors find any coherence here ? Even more so since "traditional" art history is accorded rough treatment as well : Egyptian works are situated only in reference to Jesus Christ, the notions of Middle or Old Kingdom having totally disappeared. The discourse presented by the Louvre is full of language elements initiated by Henri Loyrette which the main authors of this project have carefully repeated ad nauseam in all of the newspapers, communications media, both on television and radio. Thus, the works, now imbued with the power of speech, "would converse among themselves". We do understand what he is trying to say but we find exactly the opposite is true. The works cannot interact if the visitors do not hold the key to understanding the associations or, on the contrary, the differences. 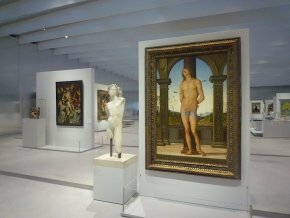 Placing a statue by Baccio Bandinelli and a Saint Sebastian by Perugino (ill. 2) next to each other of course shows that they have something in common. But without an explanation, visitors might think that one influenced the other, whereas they both refer back to Antiquity. In fact, the purely chronological hang makes this impossible. We find another, even more striking, example since it concerns works which are close in time, or at least much closer than the Egyptian statue and the Mesopotamian object mentioned above : the two small bronzes attributed to Barthélémy Prieur representing Henri IV and Marie de Medicis would willingly "converse" with Jupiter and Juno, also in bronze, after Michel Anguier. Unfortunately, they have their backs turned, a few meters apart, with no attempt at comparison. We have read all manner of statements concerning the Louvre-Lens : this is a "laboratory" for the Louvre, spinning the magic of words which need no elaboration to produce their effect. A laboratory is for carrying out experiments, some of which fail. This failure has turned out to be extremely expensive. There is no doubt that the Louvre is "a chance for Lens". However, the contrary is harder to prove despite the repeated assurances of the Louvre’s president. Without an immediate and instinctive understanding of the relationship between the objects, which was supposed to be the whole point of this presentation, the hang does not really have a "raison d’être". The works were removed from the Louvre for a meaningless purpose. 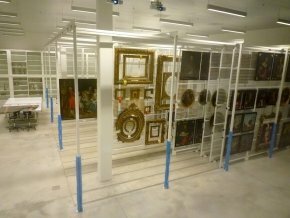 These storage rooms are thus partly empty or else decorated with mediocre paintings rejected even by the reserves at the Louvre... Apparently these facilities will be used primarily when the hangs change, as a kind of transit zone. Besides the "Galerie du Temps" and the storage rooms open to the public we should also add two spaces for temporary exhibitions. The first one, now displaying "Renaissance", is made up of various rooms, as opposed to the "Galerie du Temps". As such, it is well done, sufficiently flexible and of satisfactory size for all kinds of retrospectives. In fact, if the project had been limited to an establishment offering ambitious temporary exhibitions, as is the case at the Centre Pompidou Metz, we would have refrained from protesting. The outcome of this space will depend on the programming, that is whether or not the exhibitions demonstrate a real scholarly interest. For the moment, we cannot pronounce ourselves on "Renaissance" since we have not yet read the catalogue. Although we feared a hotchpotch (indeed how does one summarize the Renaissance in one exhibition ? ), this is not the case and the stated purpose (demonstrating the principal artistic innovations of the period) is in any case commendably ambitious and reflects some in-depth thinking with a real catalogue. Furthermore, the exhibition presents works which by their nature cannot be exhibited at the Louvre, such as Durer’s Maximilian’s Arch, engraved on thirty-six pieces and reassembled for the first time. However, the truth remains that the subject was selected only because it provided the opportunity to present Leonardo da Vinci’s Saint Anne, something we revealed as far back as 2006 announcing it would be sent to Lens for the inauguration and that there was no need to send such illustrious works in order to make the demonstration. The second temporary exhibition, organized by Pierre-Yves Le Pogam whose scholarly eminence needs no further introduction, also appears to have a real theme (the passing of time). It is based both on the Louvre collections and those from museums in northern France. Unfortunately, the information panels were not ready for the inauguration and the catalogue had not yet appeared making the subject a bit abstruse. 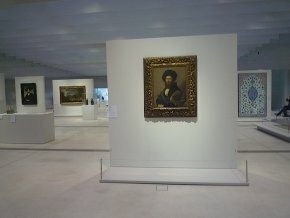 While the Louvre-Lens is being inaugurated with much pomp and circumstance, the Louvre itself is suffering the consequences. The "Grande galerie", deprived of many essential paintings, is reduced to showing certain works of more modest quality. As for visitors who travel especially to Paris to see some of these masterpieces, such as Monsieur Bertin by Ingres or La Liberté by Delacroix, they will just have to come back another time ! Of course, they can always find consolation in the audio-guide, at the significantly high price of five euros, which describes these two paintings as if they were actually hanging on the walls ! In their confusion, museum goers may waste some time in looking for them. The crux of the problem is thus the "Galerie du Temps" where a great number of crucial works from the Louvre, now missing from the permanent collections, are juxtaposed incoherently. How presumptuous that the organizers dared to remove Raphael’s Balthasar Castiglione (ill. 4) which was an integral contribution to the exhibition highlighting the painter, more than a month and a half before it closes. This goes to prove the victory of the futile over the essential, a real symbol of the Louvre-Lens.